Improvements to your home’s energy efficiency. Exceptional customer service and skilled workmanship. To schedule your free consultation today, please contact Siding & Windows Group. Vinyl windows come in an array of textures and colors that work in tune with the aesthetics of your home. 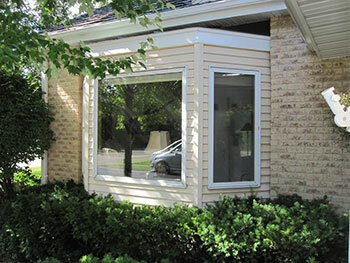 Siding & Windows Group uses Alside vinyl windows for their superior beauty, low maintenance and high energy efficiency. Wood windows help give your home an attractive and classic look. They also insulate extremely well, are highly durable and require little maintenance. For wood windows, we offer the Pella, Marvin and Andersen brands. Fiberglass windows are extremely durable, insulating and strong. They also resist condensation from moisture buildup. Siding & Windows Group is proud to offer the best brand in the industry: Integrity by Marvin Windows. Why Choose to Work with Siding & Windows Group? If you’re in the market for replacement windows in Wilmette, consider working with the most-respected vendor in the area: Siding & Windows Group. Why do so many customers choose us? Three decades of experience, a stellar reputation and a 100-percent approval rating. An industry leader in window replacement, siding and remodeling. Wide industry recognition, including an A+ rating with the Better Business Bureau, the 2010 through 2014 Super Service Award from Angie’s List, GuildQuality’s GuildMaster award for 2010 through 2015, and others. Competitive financing options, including 0-percent interest for one year through Symphony Bank. A comprehensive guarantee on our products and services. Our skilled installers can immediately improve your home’s beauty and energy efficiency with replacement windows. To find out more or to schedule your no-cost, in-home estimate, please contact us today at (847) 251-4200. This project was probably the most rewarding I have ever undertaken for my house. The people at the Siding Group were by far the most professional contractors I have ever dealt with. The job site was left cleaner than they found it each day.